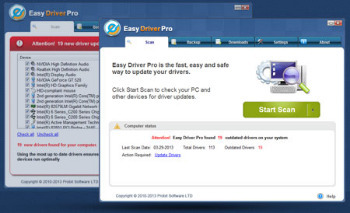 Easy Driver Pro is a simple-to-use program that allows you to update drivers on your computer. It can be handled even by less experienced users. Access to 15,000,000 device drivers including 2,500,00 drivers that are specific to computer manufacturers such as Dell, HP, Toshiba, Compaq, Gateway and other major brands. Easy Driver Pro was designed to scan and locate the necessary drivers for your PC. The easy to use user interface allows even a novice to use Easy Driver Pro without difficulty. Using Easy Driver Pro will not only save you time and money, it can keep you from installing the wrong driver for your computer. -You can get Easy Driver Pro by downloading it directly from our website. It’s a small application which you can easily install on your computer. Try it now with no obligation to buy. – With Easy Driver Pro you can backup your computer’s drivers to a CD so you don’t need to worry about losing the drivers again. Easy Driver Pro has a built in wizard that allows you to back up your computer’s drivers easily.